A time capsule of my best friend. It has been just over a week now since Andrea and I had to say goodbye to our best friend. I haven’t really publicly spoken about it yet. I wanted to take some private time to mourn, to reflect, and to heal, though the pain still lingers and I’m sure it will for a while. I also spent this time trying to think of the best way I could honor him, because he deserves so much. 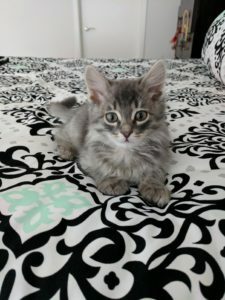 I decided that I wanted to share his story. I want to immortalize him in this text, like a time capsule of sorts. I want to tell everyone who reads this how much of an impact he had on me in such a short amount of time. It’s the very least I can do. Andrea and I finally moved in together last October. It was a long time coming. It was an exciting time, and it still is. We were happy, though we couldn’t shake the feeling that something was missing. We both came from households with pets, so the lack of one was very apparent. 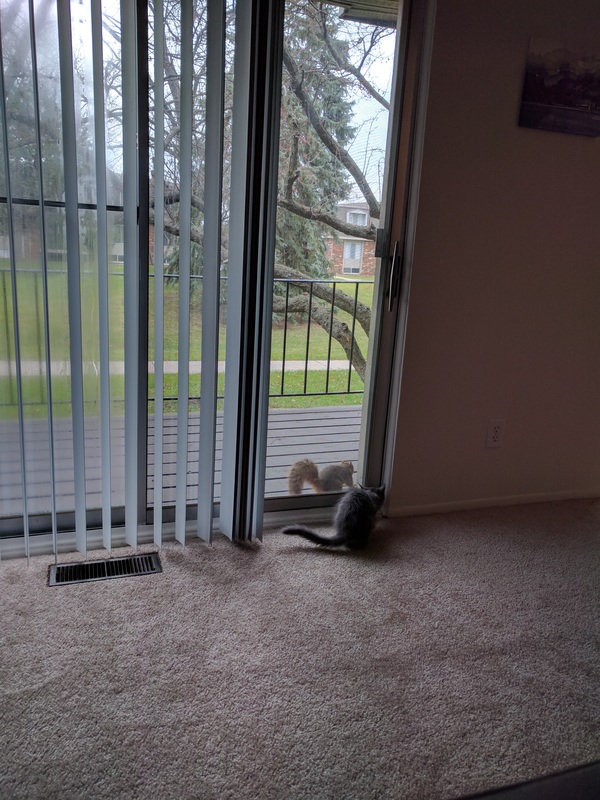 Our apartment doesn’t allow dogs, but we wouldn’t feel great about getting one anyways, since we wouldn’t have a yard for it to play in. 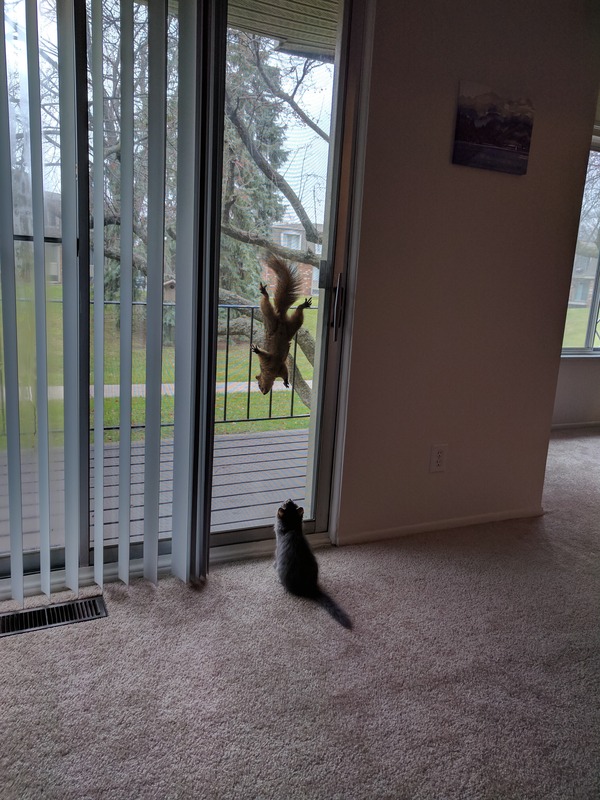 Our apartment does allow cats, however. Problem is, I am pretty allergic to them. Leave it to me to overcomplicate things. (However, since Storm I don’t really seem to be bothered by cats anymore. Strange.) Andrea couldn’t help herself though, leave it to her to dive headfirst into researching hypo/less allergenic breeds. It didn’t take long for us to land on Siberian Forest Cats, which are much less allergenic while still being really fluffy. Pretty awesome. That answer didn’t last long. Andrea inquired with some breeders in the area, and eventually we set up a time to meet with one. “Sure.” I said, figuring I’d humor her and at least check it out. I wasn’t against the idea, but I didn’t see it happening for a while. 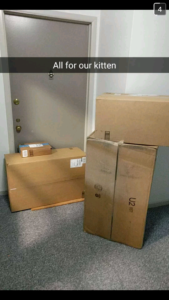 We just moved in, after all. Moving is expensive. Rent is expensive. Weddings are expensive. Pets are expensive. But why not, I figured. I was curious to see if the hypoallergenic thing was true, and I loved owning a cat when I was younger. We looked through the available kittens online and picked one we liked and set up an appointment to meet him. It was an overcast Sunday afternoon. We had been moved in for a whopping 15 whole days at the time. I was acting like a bit of a grumpy idiot that morning (what a surprise), so Andrea drove us there. 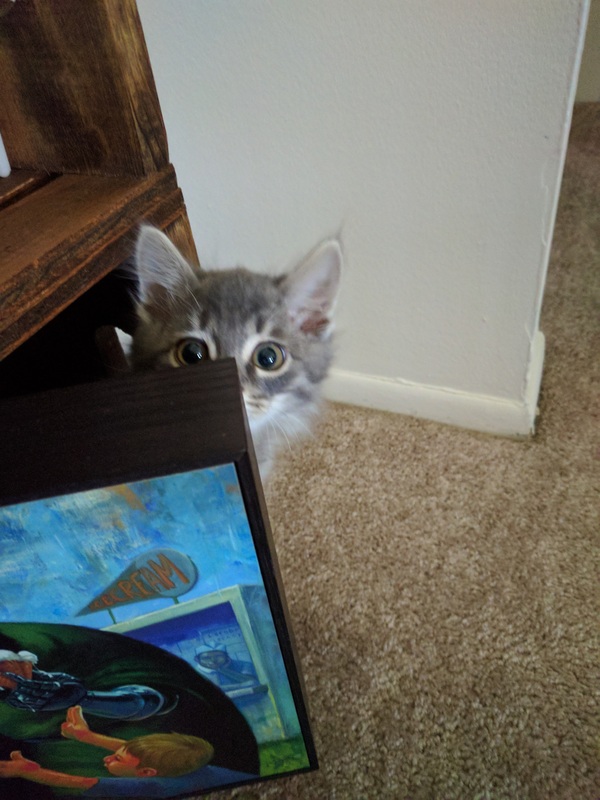 We were not actually able to spend much time with the kitten that we had originally wanted to see. The breeder said that he hadn’t been cleaned recently enough for him to be presentable, and it may have also been a bit too cold for him to hang out in the car with us, since he was still so young. 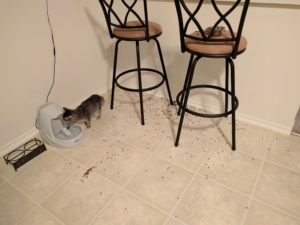 This was an allergy test as much as it was an introduction, so it made sense to do it in a neutral space like my car rather than inside of her house with all of the other cats nearby. 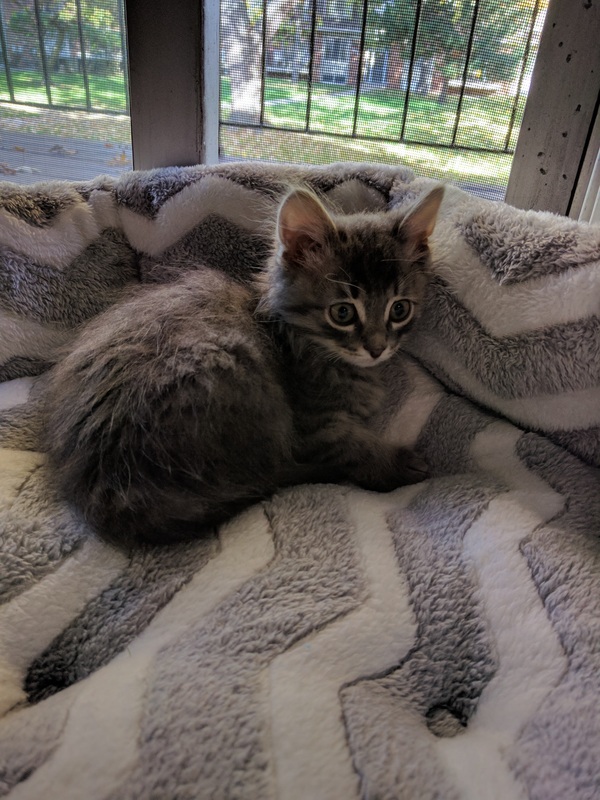 So cool, she’ll bring out another one of the kittens and we would see how my allergies would fare and if things went well we would pick up the one we were originally looking at in a few weeks when he was ready. He was a bit older than the litter that we were looking at by a couple of weeks. He was an adorable, fuzzy little grey kitty with some of the coolest markings I had ever seen. I got to hold him first. I was the allergic one, after all. He warmed up to us instantly. He immediately started loudly purring, louder than I had ever heard a cat purr before. 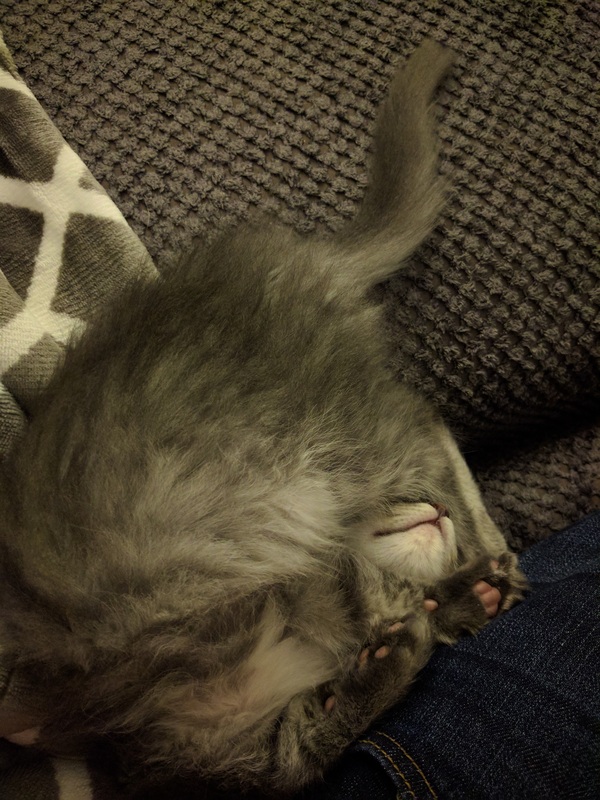 He kept alternating between being extremely playful and cozying up with us. He seemed like he was at home even though he had just met us. 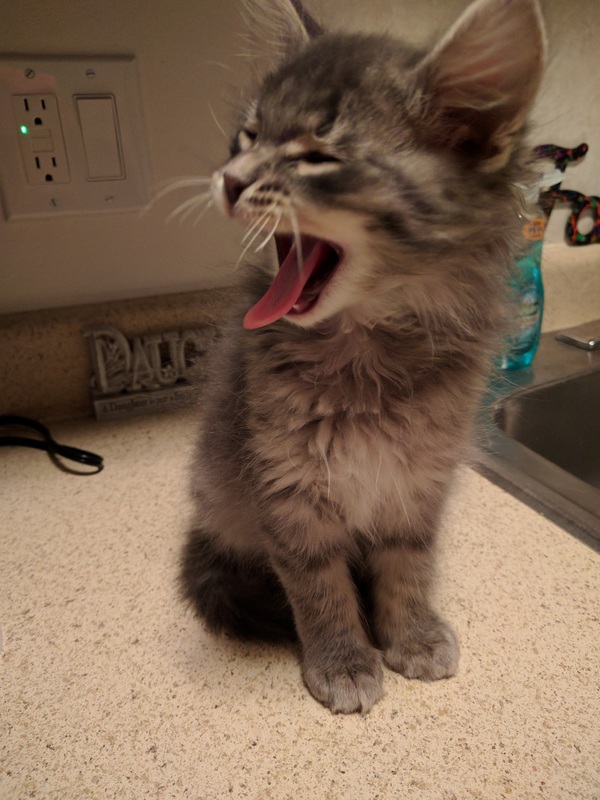 This is the first photo we ever took of him. This is what he did pretty much immediately. How could we say no?! 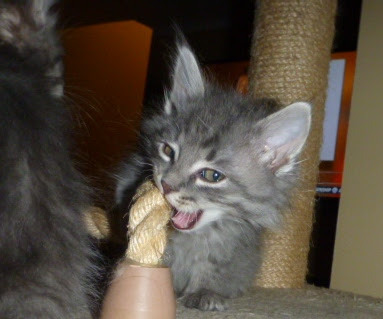 The breeder brought the other kittens out, but our minds were already made up. I think Quint’s was, too. So she dropped those kittens back off inside and we couldn’t say we wanted him fast enough. He was old enough to come home with us, but we hadn’t brought the money with us, so we reserved him and arranged to return to pick him up that following Friday. Saying goodbye was difficult. We must have spent close to an hour with him, and I already felt so attached. It made for a grueling 5-day wait as we waited for that Friday to come back around to take him home with us. I’m pretty sure I brought up how excited I was every single day to my coworkers in the days leading up to it. He was all I could think about. Here he is even younger courtesy of the breeder. What a spunky little guy! We spent those next days ordering a ton of stuff for him. Most of the necessities, but the fun stuff too. 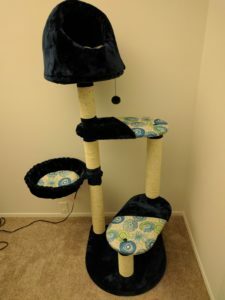 I’m sure our delivery person wasn’t too fond of us that day, but the cool cat tree and the fancy water fountain I bought for him were absolutely worth it. We wanted the little dude to have it all. We also spent that time trying to settle on a name. He didn’t really feel like a “Quint” to us, so we poured over what felt like thousands of names and only seemed to settle on a few that we could both agree on. 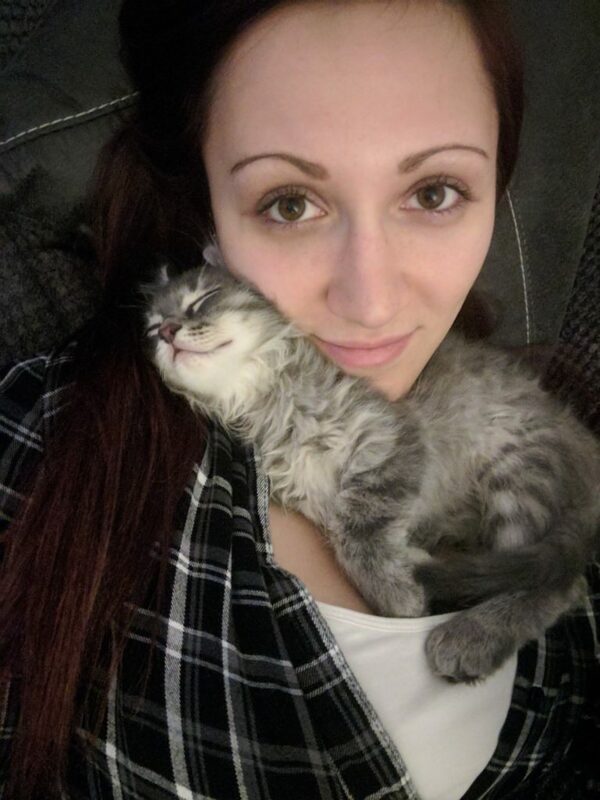 The night before we went to pick him up, we went to our local pet store to get a nametag made despite not actually settling on a name yet. Andrea left it up to me to decide, walking away from the area so it really was entirely up to me to pick one. I ended up choosing “Storm”. It’s the one we both secretly liked the most even though neither one of us wanted to force the other to pick one. I thought it suited him perfectly. 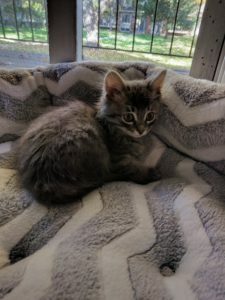 His coloring made him look like a storm cloud, and his big personality was readily apparent even in the short time I had spent with him so far, much like a bright, roaring thunderstorm. I also just thought it was cool. Sometimes that can be important too. It was almost time! Friday felt like the longest day. 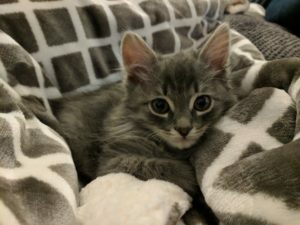 All I could think about was how badly I wanted work to be over so we could finally bring Storm home with us. I was so excited that I even drove this time. An obvious improvement from just a few days prior. I can’t think of many other times I was so personally bothered by traffic. We were so eager to see him again! 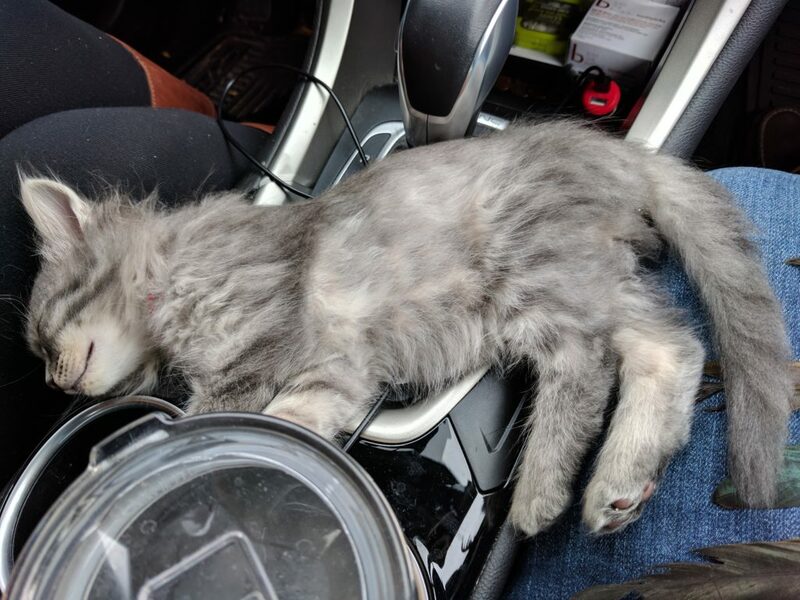 We finally arrived at the breeder’s house, and it was only then did we realize that despite the flurry of purchases we had made earlier in the week, we had forgotten to buy a cat carrier! But oh well, it was time to take him home. Thanks to my mostly-terrible handwriting (finally, it worked out in my favor! ), Andrea elected to sign most of the relevant documents in order to have them legible, giving me plenty of time to play with Storm in the meantime. It was a nice coincidence that Storm and the remainder of his litter were all getting picked up that day, so I got to play with him and 2 of his brothers. I thought it was nice that they were able to play together one last time and also all got to go to their new homes on the same day. But after a little while, it was finally time to take Storm home with us. The breeder may or may not have looked at us like we were a little crazy for not bringing a carrier, but it ended up being a good excuse for Andrea to hold and pet him during the ride back (I was jealous!) The car ride back home also ended up feeling very long, but for an entirely different reason than before. 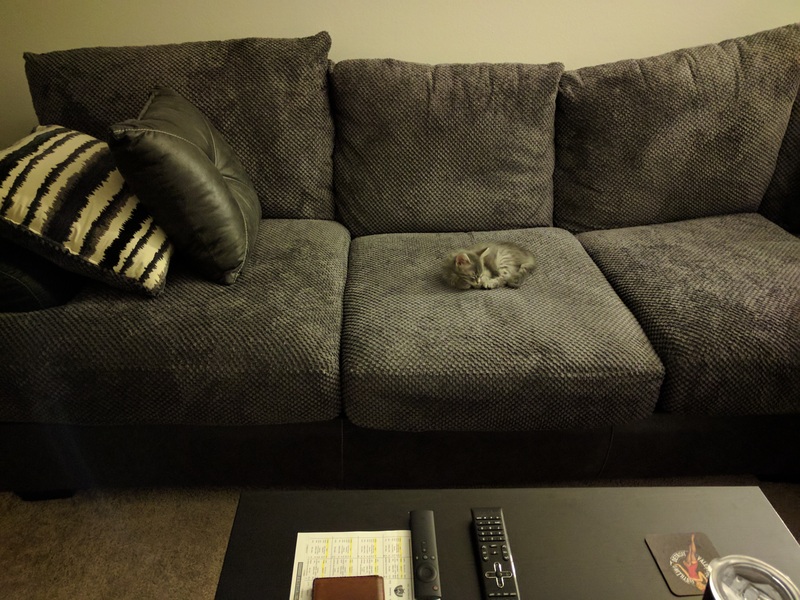 It took no time for him to settle in. If you didn’t know any better you may have thought that he had been living with us since day one. Despite being the smallest thing in our apartment, he easily filled it up the most. 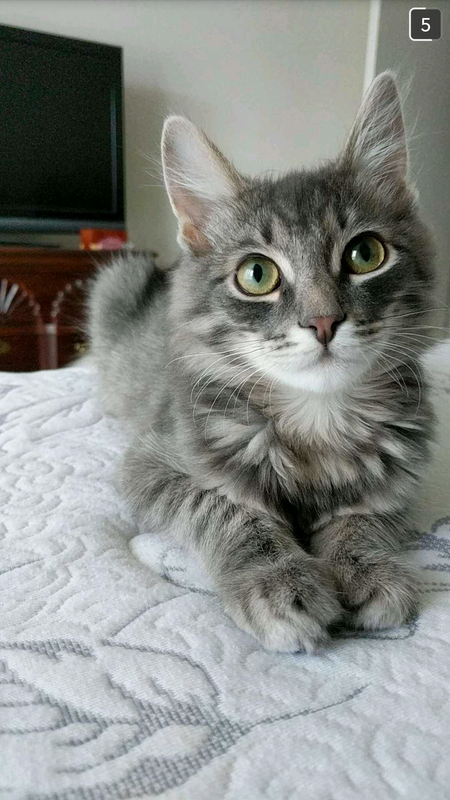 We found what we were missing, and he swiftly became the centerpiece of our lives. 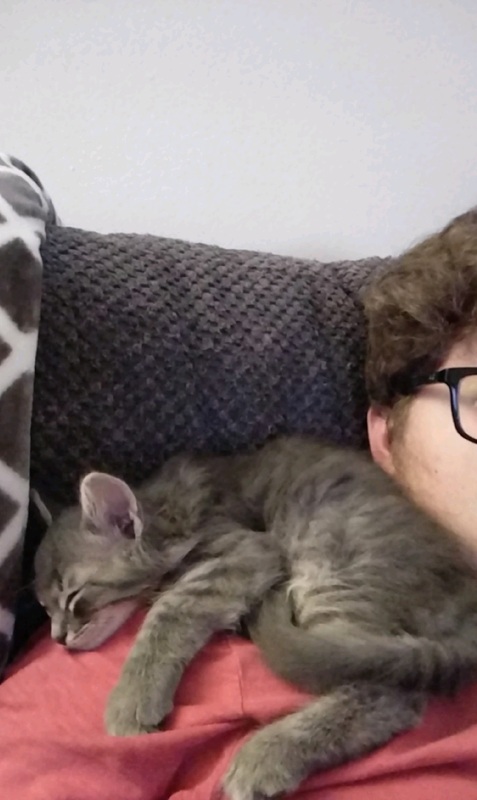 He settled in pretty quickly, as you can see. This was the very first night. He was so good around people. We made a point to try to introduce him to new people constantly, and he always loved to hang out. He is the most social cat I have ever known, and I think that was a pleasant surprise for a lot of people. 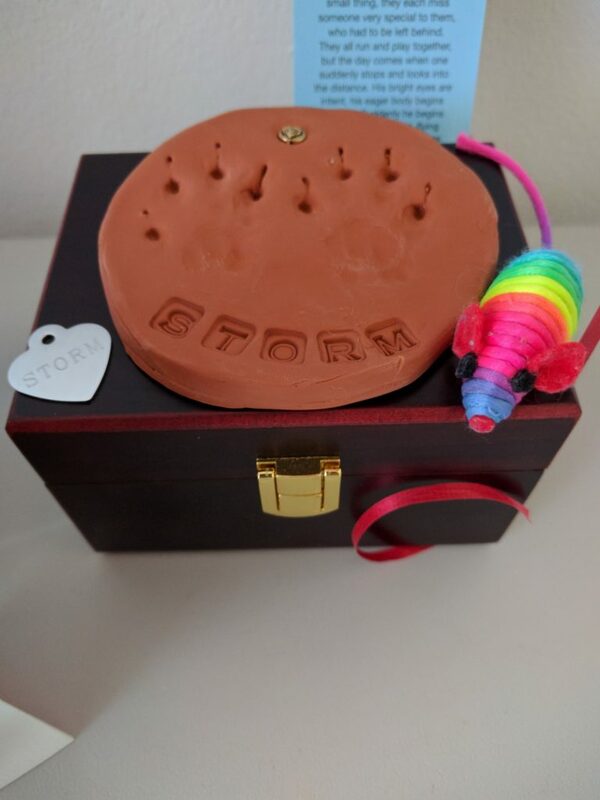 Many people seem to think of cats as animals who disappear around lesser-known people, but Storm was anything but. Many of his mannerisms were surprisingly dog-like even, down to playing fetch! Even people who do not normally like cats very much loved him, and that made us proud. His personality was just perfect. We never had a single complaint about him, and he never did anything wrong. All he ever wanted to do was hang out and play, and we were always happy to oblige. 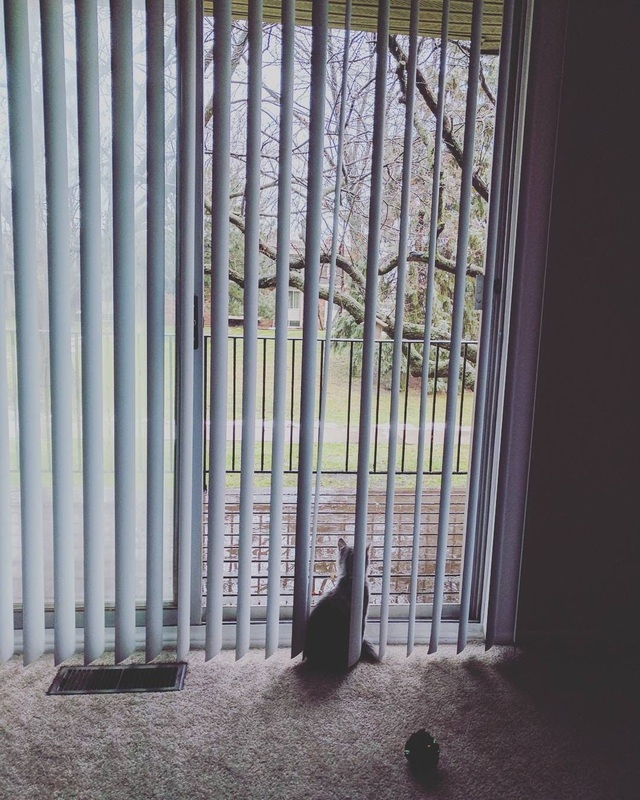 He would always cry when visitors would leave and want to go out the door to see them again, thinking that they were still there. If you ever visited for us, there’s a good chance that he cried at the door as soon as you left. He loved everyone. 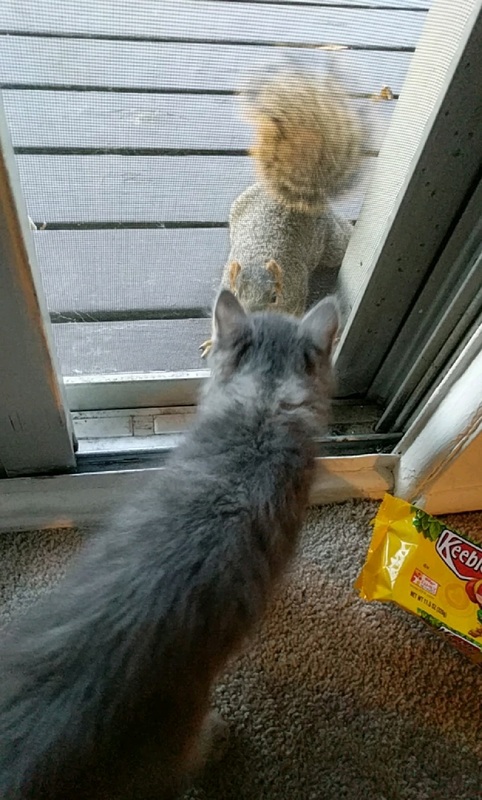 Even the local squirrels wanted to be his friend! 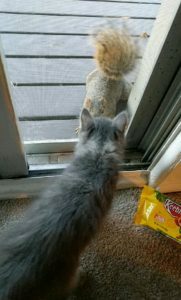 They would often visit him on our patio and he would always watch them with a quiet fascination. 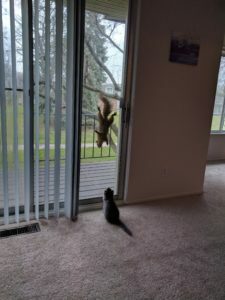 I always thought that he would try to pounce on them through our screen door or something crazy like that, but to my surprise he never did. He always seemed happy to just sit contently. He was such a peaceful little cat. 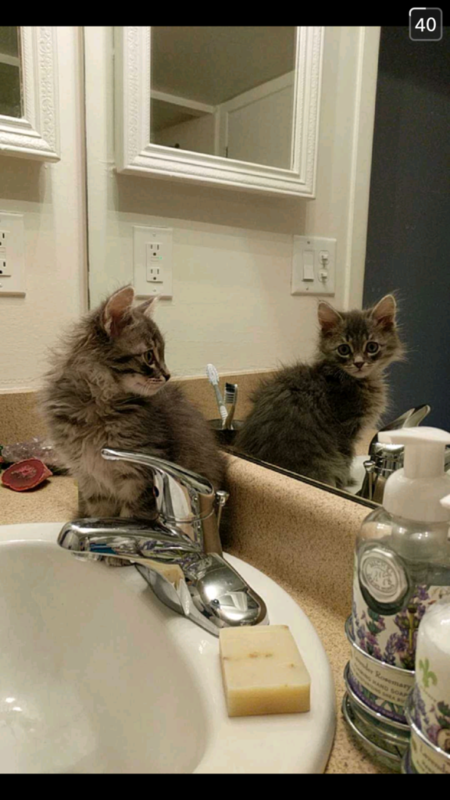 He understood mirrors at a very early age, apparently. He had so many fun quirks and mannerisms that made themselves quickly apparent. One of my favorites was how he would often lean his head backwards if something caught his interest rather than simply turning to look, like one normally would. 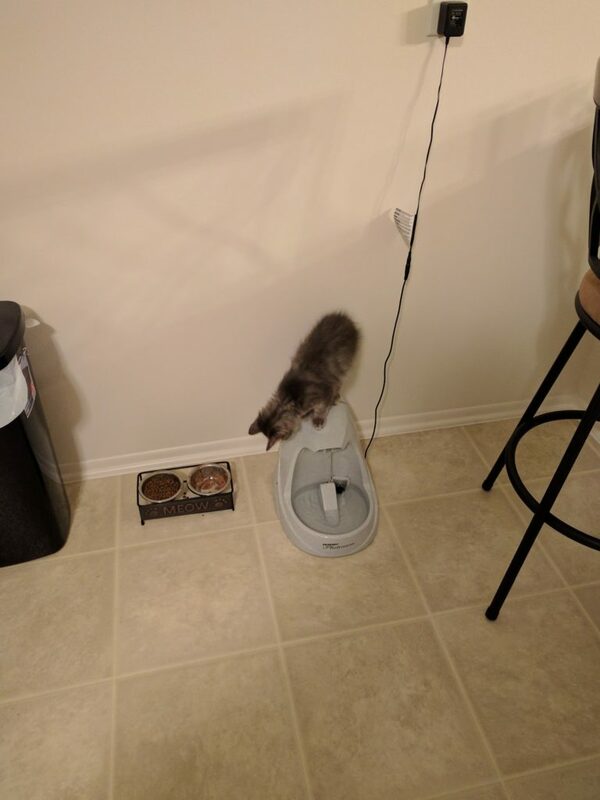 Sometimes I would find him sitting on top of his fancy water fountain thing and then leaning downwards to drink from it, rather than just drinking from it from the floor like normal. He loved sitting on my shoulder like he was a parrot, and he would still sometimes do so even as he got bigger. He always found a way. 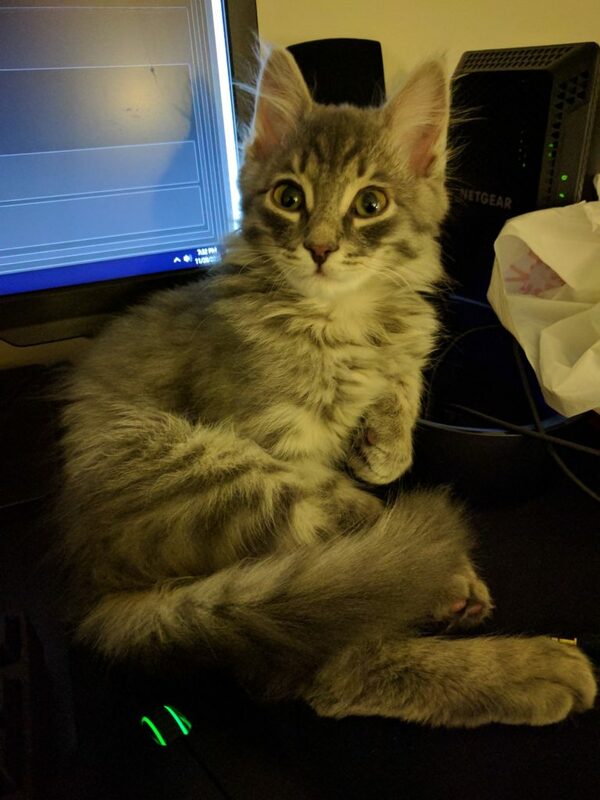 When I would be at my computer he always knew how to sit exactly on my mouse cord so my only choice would be to give him some attention. He knew exactly what he was doing, I’m sure. Often when he would purr it would be accompanied by a small whistle-sounding thing. It was silly! 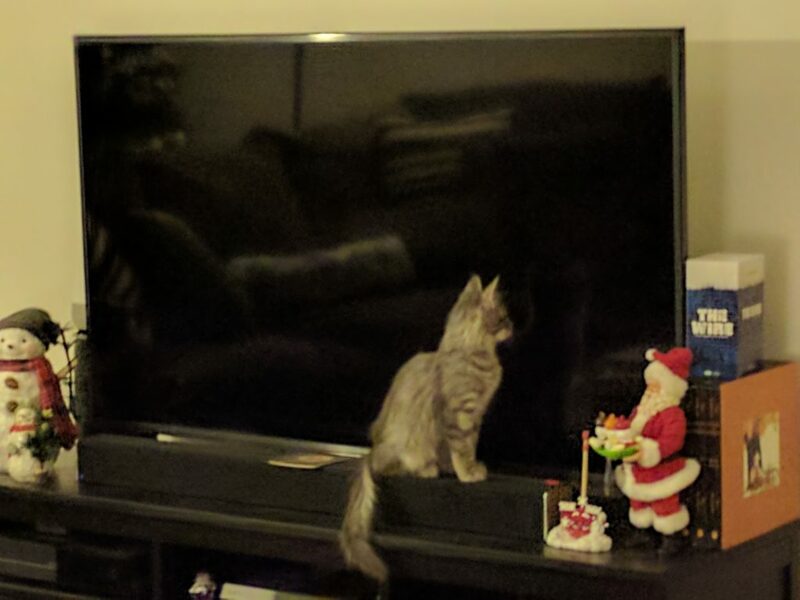 He also liked to sit on my soundbar and get as close as possible to the TV to watch it, and half of the time he ended up turning the volume all the way up in the process. Sorry neighbors! No that’s alright, I wasn’t using that. I remember that even from the first night we had him that he chose to sleep between us, and that remained true to the end. 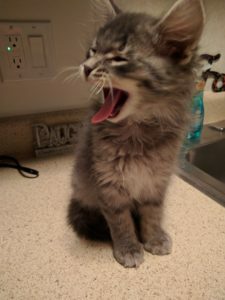 I always thought of cats as being more active in the middle of the night, but he always seemed more excited to go to bed than we ever did. 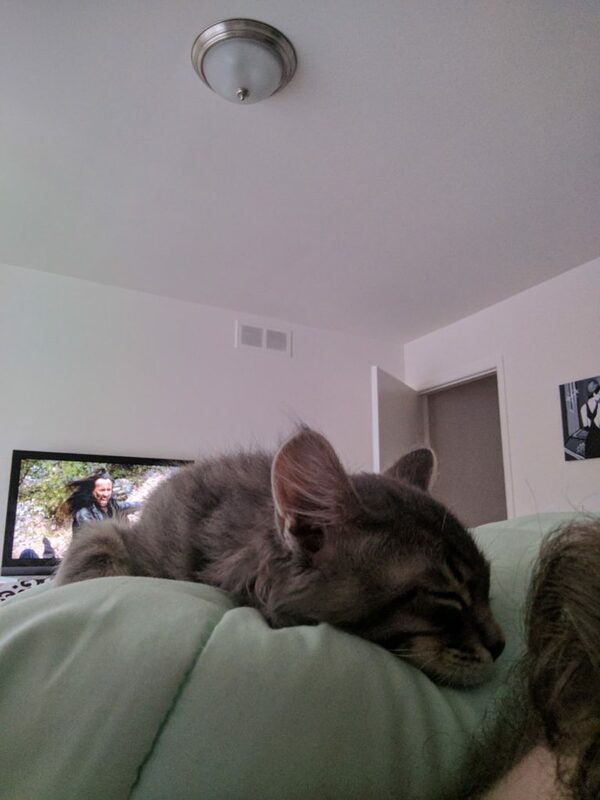 For all I know he could have gone and had some crazy adventures in the middle of the night while we were asleep, but he would always be back there with us every morning, for what it was worth. 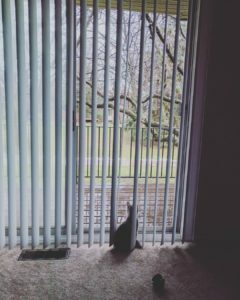 We would find him impatiently waiting for us to wake up, and he would always be so excited that we were awake to hang out with him again, even if it was just for an hour before we would leave for work. Leaving him especially earlier on was always difficult, because he would always cry when we left. I remember one time when he simply wouldn’t let me leave for work. 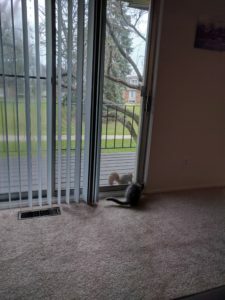 He made me really late because he kept trying to run outside to come with me, and he would keep running out faster than I could close the door. Once he got a little bit older and braver, he would always run out the door every time one of us would come home. I had to chase him upstairs quite a few times. He made me late to work more times than I can count, really. Andrea leaves before I do, so on days where she would leave and I was still in bed, he would jump back onto our bed with me and then lay on my back, conveniently right before I was about to finally get out of bed. What’s another 10 minutes, right? No that’s alright, I’ll just stay in bed a little bit longer. 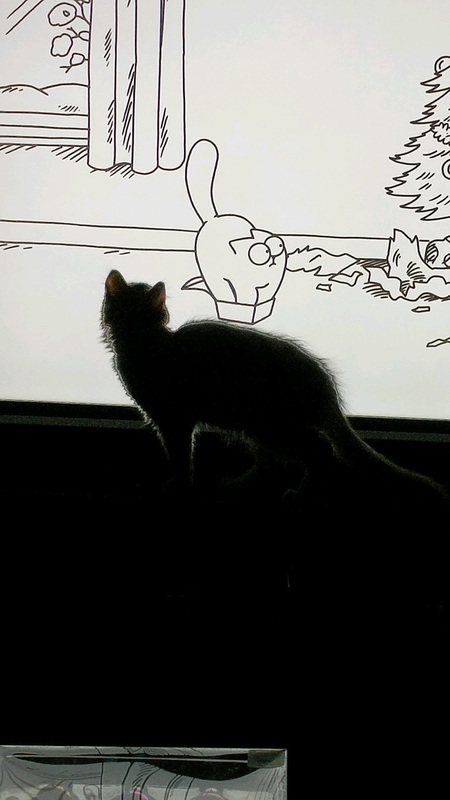 I have no idea what was on TV. I’m happy that he got to spend Christmas with us. He definitely got to make the most of it. 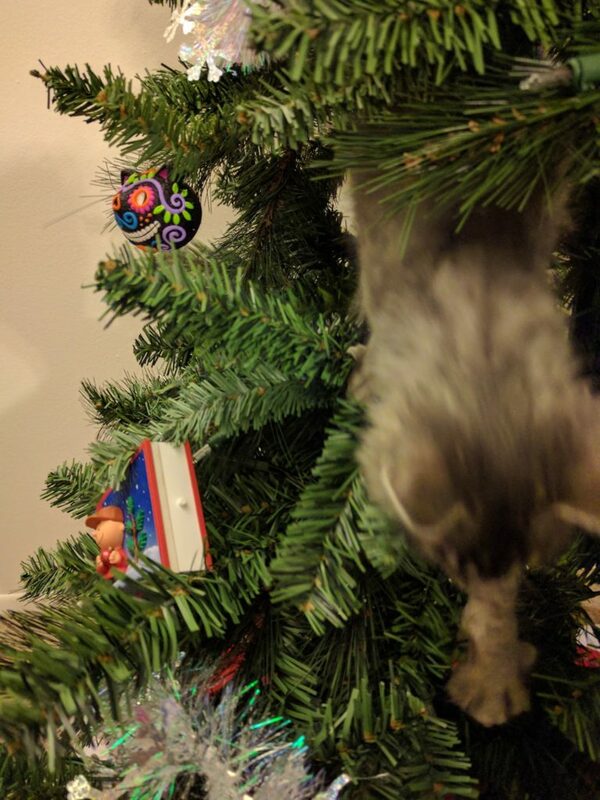 He loved climbing our tree, and we had a stocking made for him and everything. We even took him to meet Santa at our pet store! Leave it to us to be the only people to bring a cat while everyone else was in line with their dogs. 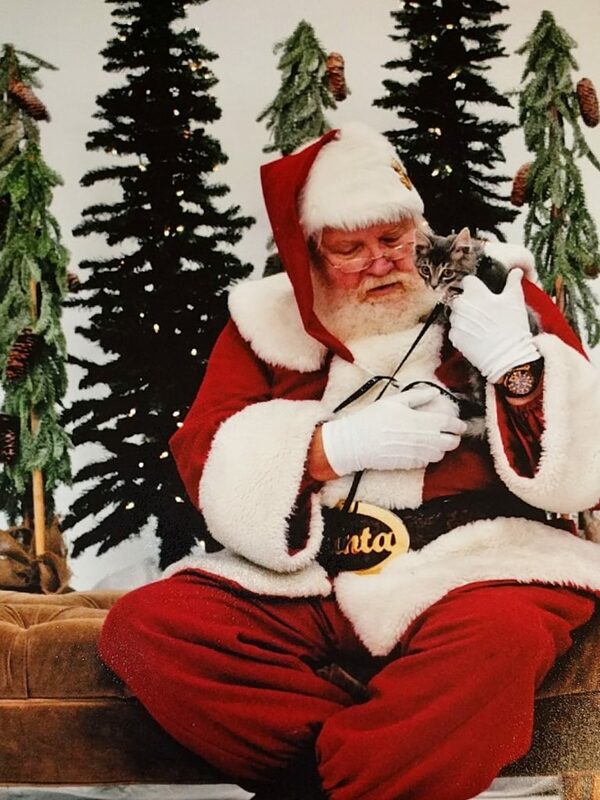 Santa said he wasn’t much of a cat guy, but even he really liked his time with Storm. Christmas was a nice time in general. I had a solid 2 weeks off of work and school, so that meant I had plenty of time to hang out with him. It helped make up for all of the time that we had to otherwise leave him home alone during the workdays, I think. He spent the majority of that break with me watching whatever I was doing. He seemed intrigued by Star Wars and watched the entire original trilogy with me, and he also loved to watch me play video games. Fittingly, he sat in my lap and watched me play through the entirety of “The Last Guardian” whenever Andrea wasn’t home. I always found that to be particularly poetic since you play as a boy exploring a mysterious place with a giant animal companion who looks and acts largely like a cat. I’m not sure how I’ll react if I ever play that game again. I can’t decide if it’ll be comforting or sad, but I think it is probably most likely that it will be a mixture of both. He also loved watching me play Megaman, probably mainly because Megaman is awesome, but I’m sure the large sprites helped keep his attention as well. 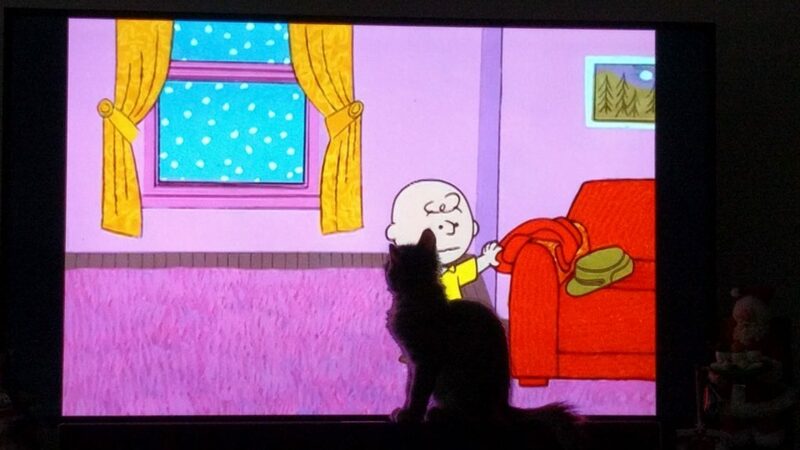 I also remember him sitting as close to the TV as possible when we watched the Charlie Brown Christmas Special. I guess he really liked that one! 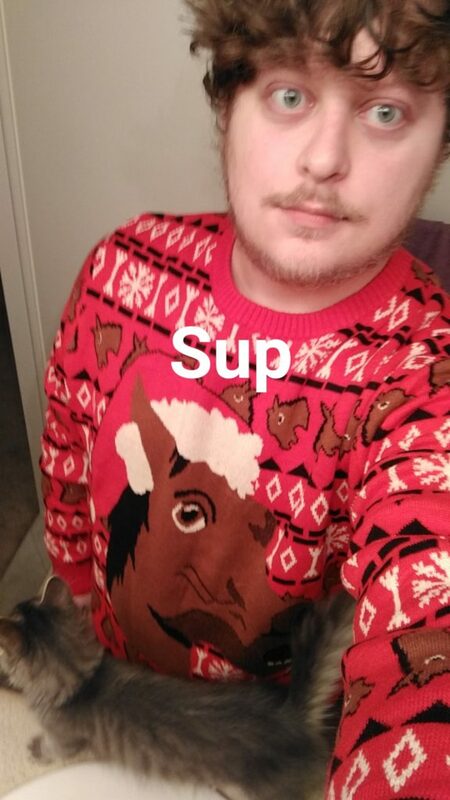 He liked my ugly sweater a lot. It’s so hard watching someone you love get sick, and watching Storm slowly decline was heartbreaking. It took a long time for us to really notice anything, but looking back now the signs slowly became more apparent. Over time he slowly got less interested in playing, and we didn’t think much of it at the time. I thought that maybe he was just bored of his toys, or maybe he was outgrowing that stage of his life (he totally shouldn’t have that early, but I didn’t know any better at the time. It was so long since I last owned a cat.) Another theory we had was maybe he just got kind of sad because he got so used to me being home for that long stretch around Christmas and maybe he was having a little bit of difficulty readjusting to our usual routine. We really didn’t have a reason to think that he was actually sick, because why would we? It wasn’t until a weekend where he was basically completely lethargic and sleeping the entire day until we began to worry. I remember it being late on a Saturday night when we started looking up the symptoms, and sudden lethargy in a kitten seemed to be something to take very seriously. I remember eventually landing on a disease called FIP, and we were terrified. Sudden lethargy in a young kitten is one of the main early symptoms of it, and the disease is incurable and eventually fatal. I didn’t sleep very well that night. I was still very concerned that Sunday, to the point where I spent the afternoon calling whatever vets were open that day. 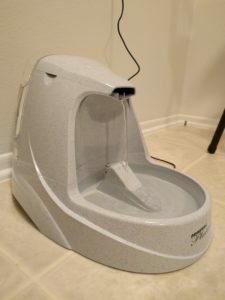 If you have never owned a pet before, all you need to know is that you generally don’t go to the vet on a Sunday unless you’re REALLY concerned, because it definitely isn’t cheap. But money was the least of my concerns at that point. I just wanted to do whatever I could to try to help him. I don’t want to focus too much on this part of the story because I mainly intend for this to a memoir of all the good parts of his life. It was a rough couple of weeks for all of us, to say the least. It was hard to see our beloved friend lose a lot of the spark he once had. He was still there, though. He still loved being with us and he would have his good days and his bad days, but most of all he fought so hard to stay with us as long as he could. Our early suspicion of FIP unfortunately ended up being true. Perhaps the hardest part of all was that there just wasn’t really much that we could do for him. We did what we could to at least keep him comfortable, but the fact that we had no way to truly cure him is what hurt us the most. Some days he would seem more like his old self than before, and we would build up this sort of false hope that maybe it wasn’t FIP after all. We learned to really appreciate those days and moments and hold onto them. Simple things that we once took for granted like being greeted at the door became truly special moments again, and as things got worse for him I know how much effort it would take him to simply get up and walk over to meet us there. Even with his limited strength and energy, he wanted to show us that he was happy to see us, and it really helped us a lot. Eventually, the time came. For whatever reason that day, I felt a strong urge to come home for lunch and spend some time with him. That was my first time ever coming home on lunch since moving. I’m glad that I was able to spend that little bit of extra time with him. It wasn’t until that evening that we came home and saw him visibly uncomfortable for the first time. It was so hard to watch. I wish we were able to give him a nicer final day. He had already gone to the vet once that day, in what was probably something like his 5th vet visit since that emergency visit on that Sunday. If we were able to have it our way, we could have had one last day to completely spoil him and spend time with him, giving him all of his favorite foods and everything. Unfortunately, things happened so fast and unpredictably. That was also the first morning that we woke up without him being next to us. We found him hiding inside the couch, a spot he hadn’t been in a long time. When it gets close to their time to go, cats tend to isolate themselves from everyone nearby to go peacefully and privately. Knowing that, combined with the fact that this was the first time he ever left us alone overnight was a definite cause for concern. I got home from work that evening and it didn’t take long for us to see that it was time. It’s the last thing we wanted to do, but we knew it was the right thing to do. We did everything that we could to help him leading up to then. The breeder even offered to take care of him in his final days for us, but we swiftly declined. He was our baby, and we wanted to be there with him through everything, even up to the end. I know he was thankful for it. 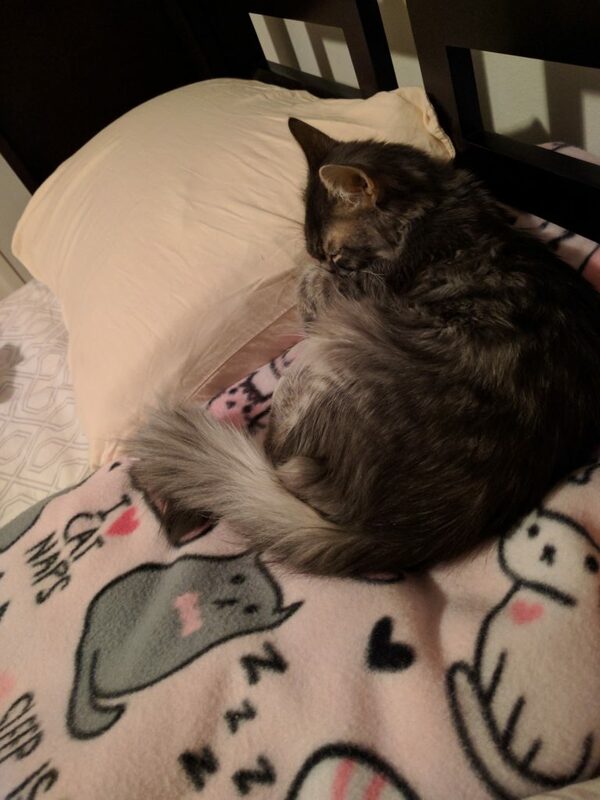 Until then, I had never really lost a “major” pet, so choosing to put him to sleep was by far the most difficult decision I have ever had to make, made even more difficult due to the fact that he was our first pet together. I wouldn’t wish that feeling on anyone. Knowing that you are doing the right thing even though it’s the last thing you want to do is a level of internal conflict that I had rarely felt until then. It was so hard to say goodbye. This is the last photo I ever took of him the night before he passed. He always loved his blanket and Andrea’s pillow. He visited me in a dream that same night, and it helped give me a sense of closure. He was like the way he was before he got sick. Lively and full of energy, and I got to play with him one last time. I’m so glad that I was able to have that experience. Maybe if I’m lucky he’ll visit me again soon. I still miss him so much. Sometimes I still come home expecting him to be waiting to greet me at the other end of our door. Sometimes I feel like I’ll still see him in the corner of my eye at the moment as I subconsciously look out for him to make sure I’m not about to accidentally step on him. He was like a little ninja and would somehow beat me to whatever room I would be walking to without me even seeing him, so I guess I’m still expecting that from time to time to some extent. I miss the urgency I used to feel pushing me to get home from work as soon as I could to hang out with him. It’s so hard not having him here with us. 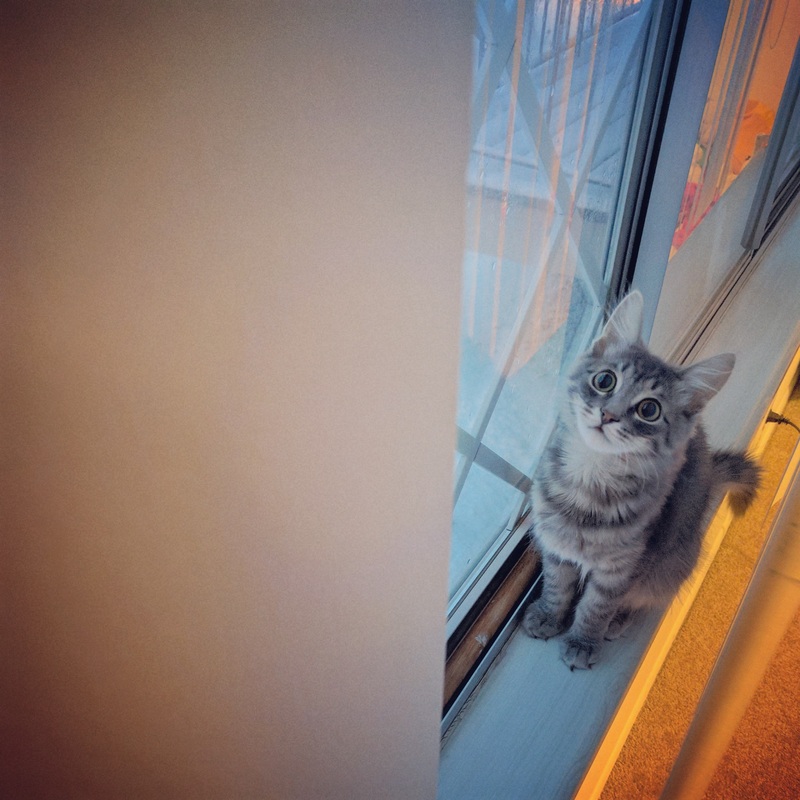 Our apartment feels much emptier with his absence, and we’re both anxiously awaiting our opportunity to get another cat in the coming months. Storm is undeniably irreplaceable, but I know we will end up loving our next cat just as much. It’s what he would want for us and them. I also want to thank our wonderful vet who helped us through it all every step of the way. The entire staff at Greenfield Animal Hospital was fantastic, and I know they all loved him too. We look forward to returning to them with our future pets. I’m glad I took so many photos and videos of him. Looking back now, I am honestly kind of taken aback by how many I took. I typically don’t use my phone camera much, but I probably took more photos of him than I would otherwise take in the whole lifespan of owning a phone. I think there were some days where I took more photos of him than I did during my entire trip to New York, which was my dream vacation ever since I was a kid. It’s such a minor thing, but one of the videos I took of him at one point was me just coming home from work and having him greet me at the door. I’m not even really sure why I did it, but I’m endlessly glad that I did, looking back now. They have been such nice things to have during the times that I miss him most. 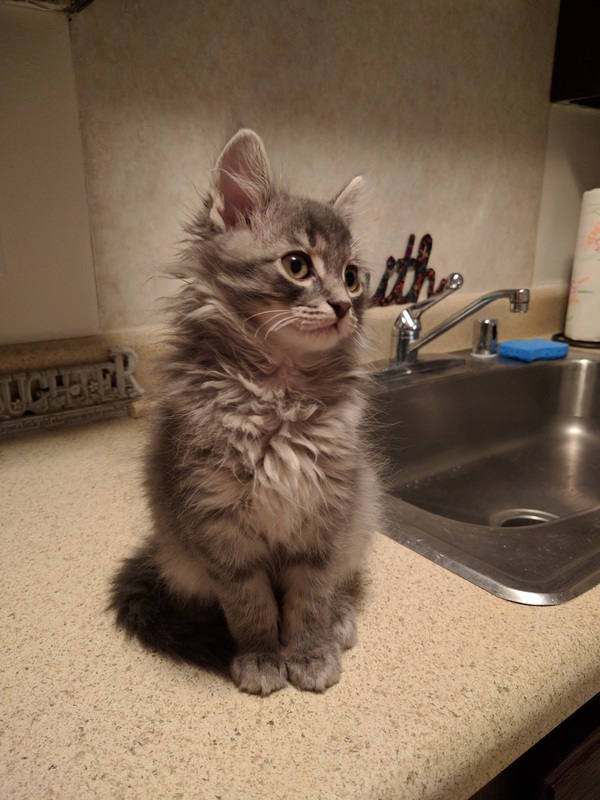 He was more photogenic from day one than I have ever been in my entire life. He was a cat of many talents. I miss you, Storm. I miss the way you would claw up my legs whenever I would come home. I have tiny holes in the pants I am wearing right now left over from you and it has been a nice comfort to run my fingers over them as I write this. I miss stepping on the litter you would inevitably always leave scattered around your box, no matter what we tried. I miss going into the kitchen at 11 at night to grab a handful of chips only to find you also sneaking a late night snack at your food bowl. 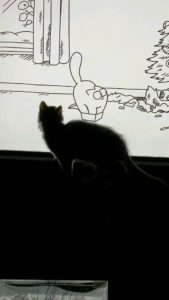 I miss your long, bushy tail that was somehow noticeably longer than the rest of your body and thinking about how it meant that you would probably grow up to be enormous to match the rest of your personality, and the way you would curl it around yourself or lazily wag it around when you were content. 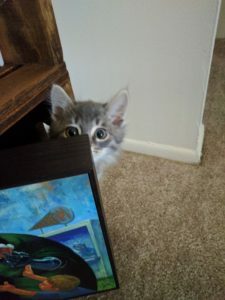 I miss the way you would excitedly pounce on my feet in the middle of the night when they would move under the covers. I miss the way I could just drop a Soylent cap on the floor for you when I would finish one and you would play with it for hours. 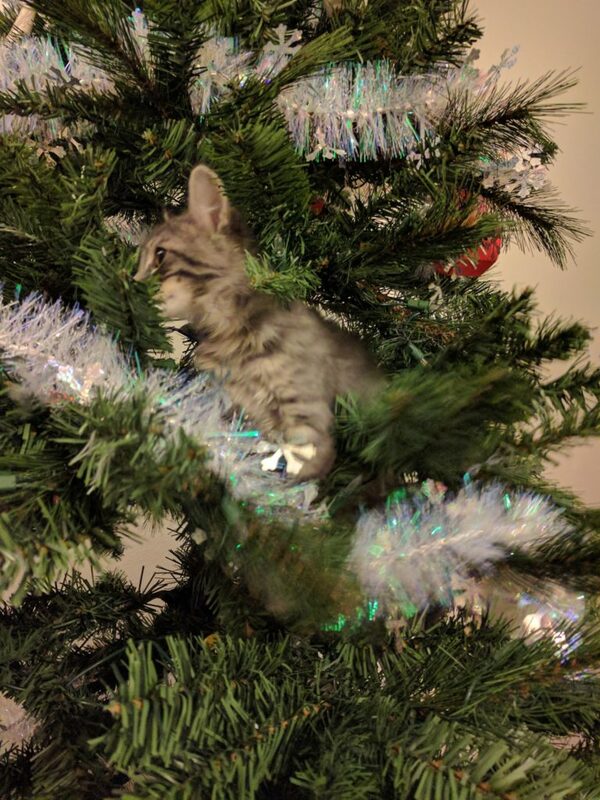 I miss all the times I couldn’t find you and would freak out thinking you somehow got out but of course I would find you at the top of your cat tree looking at me like I was a big silly idiot. I miss coming home late at night from school or turning around from my computer to see you and Andrea sleeping on the couch, typically halfway through whatever show Andrea was watching, and often with her using you as a pillow, which you never seemed to mind. I miss telling you that I love you every single morning right before I’d leave for work. I probably said it to you more consistently than I even say it to Andrea (note to self: work on that). I just miss having you here with us. You didn’t deserve that terrible disease at all, and it still pains me to think about how you were one of the unlucky few. You deserved a long, happy, and healthy life. You deserved so much more than that. With all of that being said, no matter how much this hurt to go through, I’m endlessly-thankful that he was able to be a part of my life, even in the short time that he was around. He made everything about our lives so much better, and I’m immeasurably glad for it. He gave me what felt like a whole lifetime’s worth of happiness in just a few short months, and I will never forget him. Here are a bunch more photos and videos that I wanted to share. I’m glad we took so many. This is probably my favorite image of him out of all of the ones that I took. I think it perfectly captures his life and life with him. 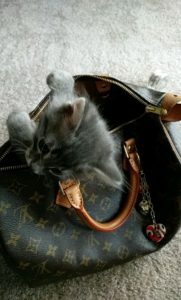 He wanted us to take him with us! Thought I wouldn’t be able to find him behind my Doctor DOOM Canvas. 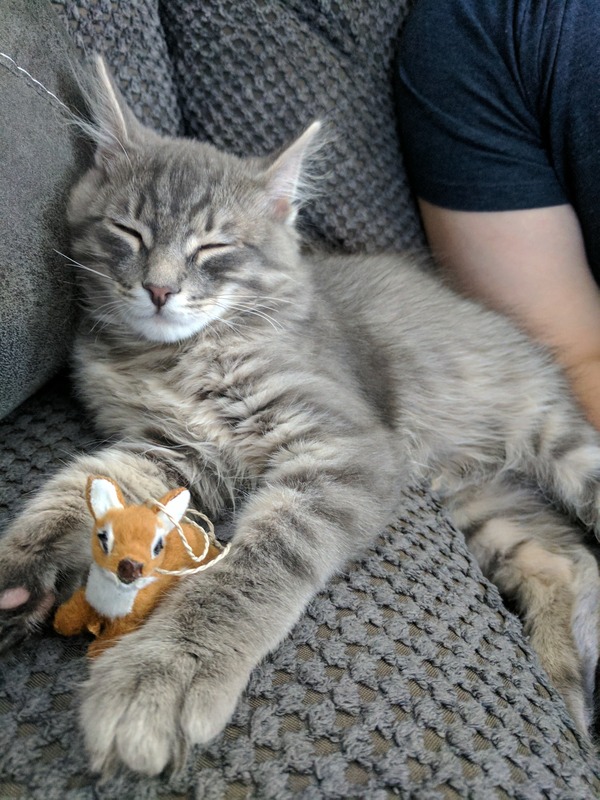 He loved that little deer. We’re still trying to find where he hid that thing, actually. 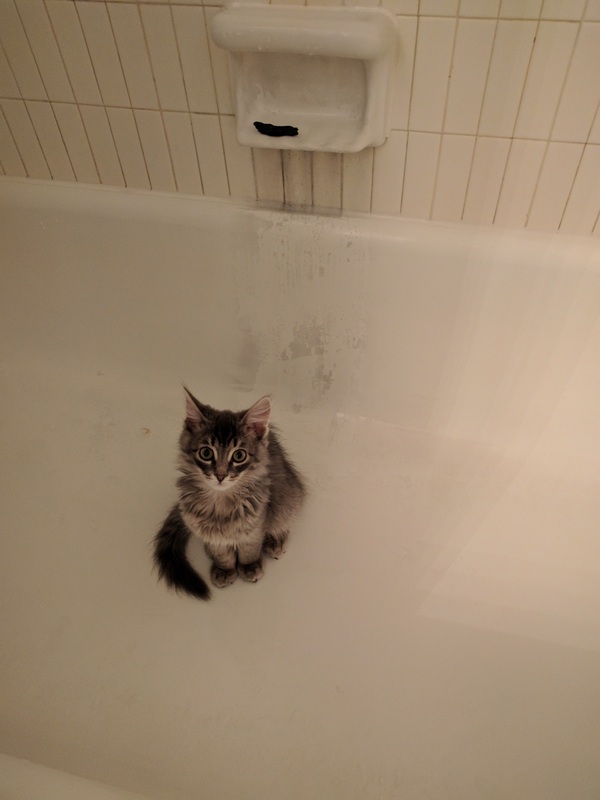 He loved hanging out in the tub after either of us would shower. Also: Black soap isn’t the nicest looking thing. 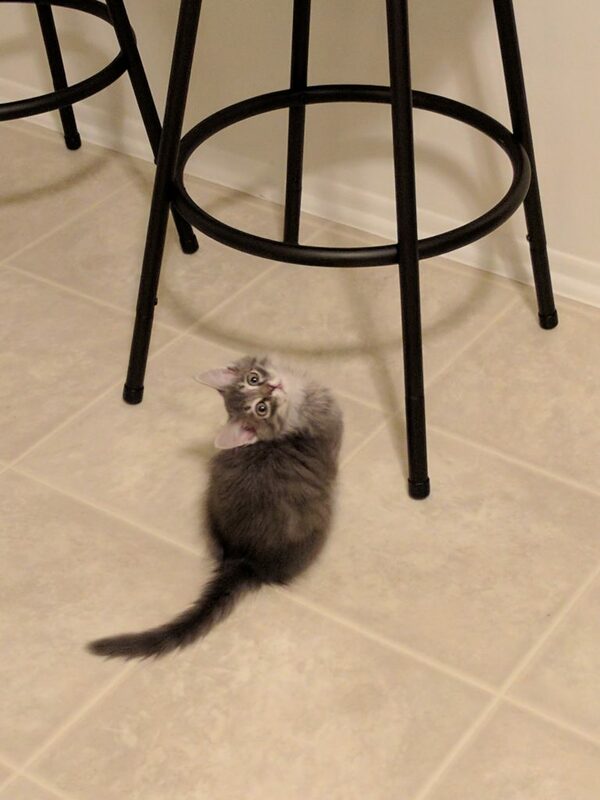 I forgot exactly how small he used to be until I saw this one again. He took up just a small corner of his bed at first, but quickly grew into it much better. So small! He always matched our decor so well, too. We love you, Storm. We always will. Thank you for everything.